Inmarsat’s Voice Distress Calling service provides full priority access in both ship-shore and shore-ship communication in emergency situations, together with pre-emption for distress priority calls initiated by activation of the ‘red button’. Essentially, the service is able to interrupt any non-urgent calls once the distress button has been activated and gives full priority to subsequent emergency communications and so improve safety onboard. The Voice Distress calling service provides full priority access in both ship-shore and shore-ship communication in emergency situations, together with pre-emption for distress priority call initiated by the activation of the “red button”. Essentially, the service is able to interrupt any non-urgent calls once the distress button has been activated and give full priority to subsequent emergency communications and hereby improve the safety on board. The distress call from the FleetBroadband system is a voice call, which means that the call will be connected to an operator at the MRCC (Maritime Rescue Coordination Center). Each Inmarsat satellite region has a nominated MRCC, which assesses the call and directs details to a suitable rescue co-ordination centre near to the scene of the incident. 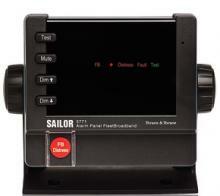 Please note that the service is not GMDSS compliant. Distress pre-emption and priority voice call Pre-emption and Priority Calls enable the possibility of calling either to or from a vessel in distress even if the FleetBroandband voice line is already busy in an in- or outbound call. If a Voice Distress call is made, any existing calls will be terminated. Pre-emption is for giving the RCC the ability to contact the vessel in distress or a vessel in close proximity even if the line is busy. • Priority is for giving the Distress call priority over any other call from the terminal. In an emergency, pressing the button on the Alarm Panel will connect you to one of three MRCCs strategically located across the globe, one for each satellite. You will be offered assistance in any type of emergency. If you require rescue or other action, the MRCC will ensure you receive prompt assistance from those best suited to address your circumstances and location. Simply lift the cover and press the red button on the Alarm Panel until beeps sounds continuously (Press and hold for 5 sec.). The phone will ring when the connection to the RCC is established. Since this is a voice only solutions position, vessel name etc. is not transferred in the call establishment and will have to be given to the operator.